ISTiOSELIDA - Sailing ONLY: King Ben wins the Monsoon Cup & and the World Championship! King Ben wins the Monsoon Cup & and the World Championship! A thrilling five race final at the 2010 Monsoon Cup, which is the ninth and final event on the ISAF World Match Racing Tour.Ben Ainslie and TEAMORIGIN demonstrated why they are champions completing the double, securing both the 2010 ISAF Match Racing World Championship and the Monsoon Cup. Sailed from the purpose built Ri-Yaz Heritage Marina Resort and Spa in Kuala Terengganu in Malaysia, the Monsoon Cup is the richest event on the Tour card and has on offer more points than any other Tour event. 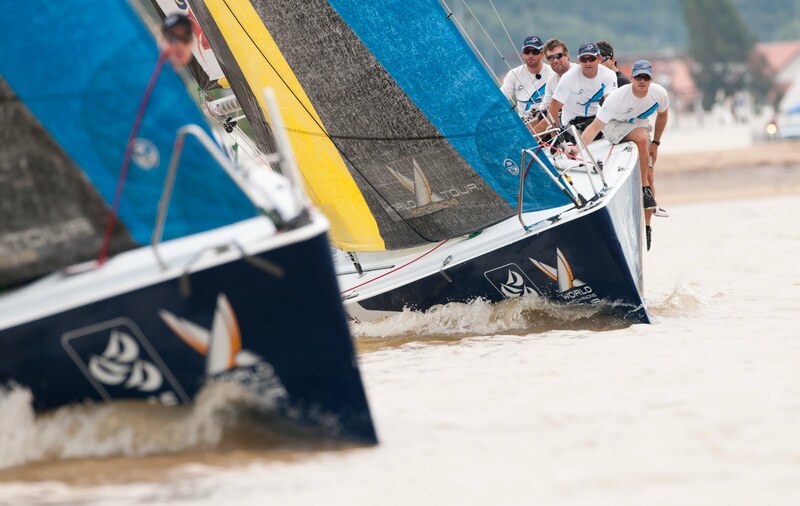 Coming into this event a lot was a stake – the Monsoon Cup 2010 and the ISAF Match Racing World Championship. Mathieu Richard (French Match Racing Team) came into the regatta with a large Tour Championship lead. Defending ISAF World Champion Adam Minoprio (ETNZ/BlackMatch Racing) was chasing hard and mathematically, three others skippers were also in World title running. The last few days have produced exciting match racing out on Pulau Duyong. The conditions have been mainly light and tricky, torrential Monsoon rains swelling the river and producing current, testing skippers and tacticians alike. Earlier, on this final day, Ben Ainslie and his TEAMORIGIN crew – Iain Percy, Christian Kamp, Matthew Cornwell and Mike Mottl, became the new ISAF Match Racing World Champions. After choosing Richard as his quarter final opponent, Ainslie went about demolishing the French skipper leaving Richard with a very slim hope of taking the World title. Richard had to finish fifth or higher in the Monsoon Cup to take the win. Defeat in the sail-offs ended that hope. The Final of the Monsoon Cup got underway in about 12-14 knots of breeze. The rain stopped and the sun finally showed through the clouds. In the Petite Final, Danish skipper Jesper Radich (Gaastra Racing Team) defeated Sweden’s Bjorn Hansen (Hansen Global Team) 2-0. Radich, with three second places in his three starts this season (Argo Gold Cup, Stena Match Cup and Match Cup Germany) finished third at the Monsoon Cup, taking home a share of the considerable prize money. Ben Ainslie (TEAMORIGIN) defeated Torvar Mirsky (Mirsky Racing Team) 3-2. "Congratulations to Ben and his Team, they have sailed well all year. They have shown they are indeed World Champions."